Ivor is one of the first staff members to Leopard Mountain dating back to the founding stages of the lodge. He has a great passion for everything Wildlife and a dedication for guiding that has seen him go from strength to strength in his 16 years in the industry. Soft Spoken is definitely not a way to describe his personality – for those who have met him it’s quite possibly the polar opposite. But it’s this personality and ‘filterless’ quality that has survived him in such an extroverted position. “I feed off of other people’s energy and love going on drives with unique guests. I’m at my best when I am in nature exploring and sharing my knowledge and experience with others.” Says Ivor. 1.WHAT MADE YOU PURSUE THIS CAREER? After school I signed up to study Architecture in Durban (yes very different I know). Before my studies started, there was a short Game Ranging course that I went on just for laughs (I really just wanted to spend some downtime in the bush and maybe meet a girl…..) 16 years later and I have never looked back, I guess you could say I fell in love – with the job and the girl. What qualifications did you have to get to get to your level? I obtained a FGASA level 1 qualification and since then I have advanced to FGASA Level 2 and Savannah Biome Trails Guide (which allows me to do walking safaris). 2.WHAT MADE YOU CHOOSE LEOPARD MOUNTAIN? I worked here in the beginning of my career and fell in love with the Northern Zululand Environment. I left after a short while and when an opportunity to work in the ZRR popped up I snatched at it. 3.HAS ANYONE BEEN INSTRUMENTAL IN YOUR JOURNEY TO BECOMING A GAME RANGER? My wife – she has spent so long testing me before exams that I am pretty sure she is as knowledgeable as I am! 4. WHAT HAS BEEN YOUR ABSOLUTE TOP SIGHTING SO FAR? There are so many it is hard to choose… Elephant bulls fighting, Lions hunting Buffalo, a young Leopard playing with its mom, Wilddogs hunting, Wilddogs fighting with a Hyena, a Python eating an Impala….. It is easier to say which is my favourite animal to view – WILDDOGS! They are always busy doing something and if you stick with them they will always reward your patience. 5. WHAT DO YOU THINK THE THREE ESSENTIAL ITEMS ARE FOR ANY SAFARI? Camera! Always take your camera – you never know what will happen. Binoculars – because the guides will try get you into a good position but it is not always possible. A sense of humour – life is too short to be grumpy (all the time). 6.WHAT HAS BEEN YOUR BEST EXPERIENCE AS A RANGER? 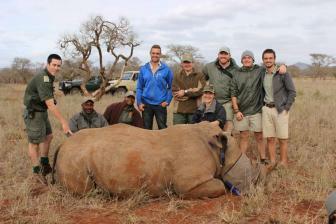 We did a 6 night overnight walking safari for guests that were raising money to help stop Rhino Poaching. The one lady had never seen a live rhino and she cried with happiness/ relief/ sadness… It was amazing! 7.WHAT’S THE BEST PART OF YOUR DAY? When I am guiding I always try and arrive at the lodge before anyone else – I sit alone on the deck and drink my coffee listening to the bush wake up, its awe inspiring to say the least!